What a beautiful winter and spring! You're looking at the home office for five months of 1996, and six months of 1997! Kathy was moving up to Julian to work as an outdoor educator. My work responsibilities were research and writing, including a monster business plan and a manual on virtual-homed web development and W3 site administration. 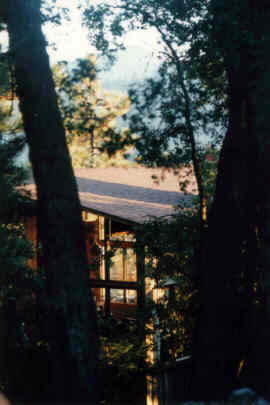 My folks have a beautiful cabin on North Peak above lake Cuyamaca, so we rented it for the winter and spring. 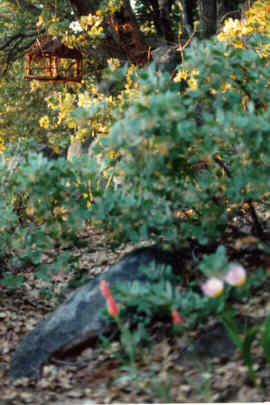 Unlike the warm coastal climate of Del Mar, Cuyamaca and Julian actually have all four seasons. We surrendered our killer apartment in Del Mar, California. We loaded an entire Local Area Network of Linux and NT boxes, my guitars, and some food into the car, and headed up to lake Cuyamaca. The whole five month experience in 1996 made me a strong believer in telecommuting. Once the phone company made it up the road and found the unmarked house, I had Internet access, albeit at $.25 a minute and no dice whenever it the wind picked up (about twice a day). For the Summer and Fall of 1996, we crossed the 50-mile buffer of natural beauty and lived in Tierrasanta, dead-in-between Kathy's teaching credential program at SDSU and the office building that housed my work: ARK Enterprises and Kensho, LLC. 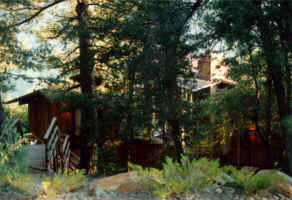 There were all sorts of deer and coyote and hawk and raccoon around our 5-story rented home in suburbia. It was great fun telling clients and coworkers that I was snowed in or snowed out every few weeks, two years running. Actually figuring out how to drive with chains and shoveling out the driveway wasn't so fun. I spent my 28th birthday hiking two miles down the mountain through heavy snow to get out to the main road and catch a plane for three job interviews in Boston. The distinction between solitude and isolation faded at times up here. interactivate, offered to let me telecommune indefinitely (much more patient than the landlords :-), willingly shelling out $300-$600 per month to pay for some serious remote dialup hours. Days after cable internet access became available on the Del Mar lagoon in Carmel Valley, we secured an apartment by the beach and left the incredible peace, quiet, and clean air in exchange for high speed Internet access. Very tough trade.